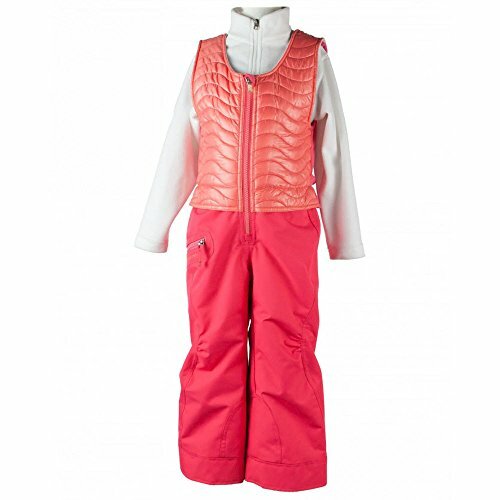 The Ober-All Bib keeps all the cold and snow at bay whether she's out sledding or on the ski hill. A quilted front bib with a fleece back and Obermeyer's exclusive HydroBlockAr Sport 10,000mm waterproof/breathable technology with high loft 120 gram premium insulation insures her staying warm and dry. The original 'I-Grow'�,� Extended Wear System has built-in technology to increase cuff length by 2 inches. Functional features consist of critically seams sealed, reflective trims, reinforced pant hems, inseams, and scuff guards, and water-resistant powder cuffs. HydroBlockAr Sport 100% Polyester Micro Twill. HydroBlockAr DWR 100% Polyester. 100% Polyester 150wt fleece. Insulation: High Loft 120gm front body, 80gm pant. Quilted front bib with fleece back. Double layer, reinforced knees and seat. Reinforced pant hems, inseams, and scuffguards. Thigh pocket. Water-resistant powder cuffs. Interior windguard with fleece chin protector. HydroBlock�,� Sport resists up to 10,000mm before water penetration while allowing 10,000 grams of water vapor to pass through within a 24-hour time frame. Obermeyer Authentic I-Grow proprietary system features a simple and unique way to lengthen the sleeves and cuffs by 1 inches. Adjustable, quick release shoulder straps. Full-Motion�,� Critical Seam Sealing. .